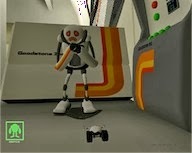 Robotto is a game developed by Team 6 (Rymdpiraterna), as part of the DADIU education. I was the team's Lead Programmer. The team consisted of one game director, one game designer, two visual designers, two animators, two audio designer and three programmers. The team was given one month to produce the game. You play as small little robot on four wheel, who needs to help Robotto (the large robot) get regain control of his sapceship just hijacked by mean robot pirats. The constraints for the game was that it was supposed to be playable by 8 year old kids and you were only allowed to maximum use 4 buttons to control the game. My contributions as a programmer consisted of creating the follow/flee mechanism for Robotto but I also created the cutscene modes in the game and various scripting for the audio designers. All coding was done in C++.